16137. (photo) U.S. Life-Saving Service Station, Ashtabula, Ohio c.1900. 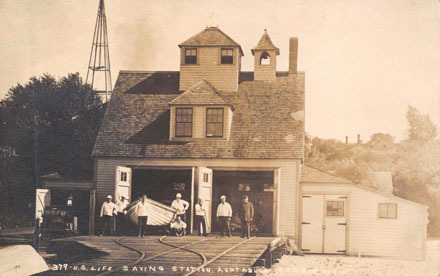 This rare photo features a close image of the one-of-a-kind life-saving station designed by George R. Tolman and constructed in 18892-93. Wonderful view includes the station front as the crew watches from the boatramp. They would be later sold. Measurement 3 ½” x 5 ½” on postcard paper. Clear, rare early view. (VG+). $78. 16100b. (Copy photo from original) Lifeboat Roll Over Drill, Cleveland Life-Saving Station, Ohio c.1891. 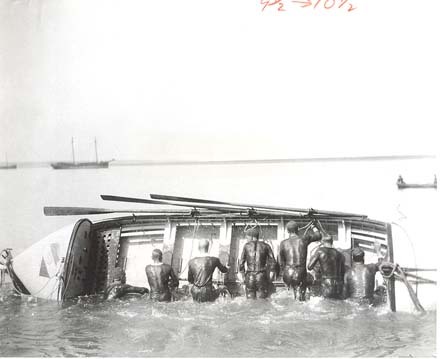 Clear, close, 8” x 10” copy photo from an original at the Western Reserve Historical Society, shows excellent detail of the lifeboat and men as they practice the roll Over drill. Great detail of the interior of the lifeboat. (VG+). $88. 16100a. (Copy photo from original) U.S. Life-Saving Station, Cleveland, Ohio c.1891. 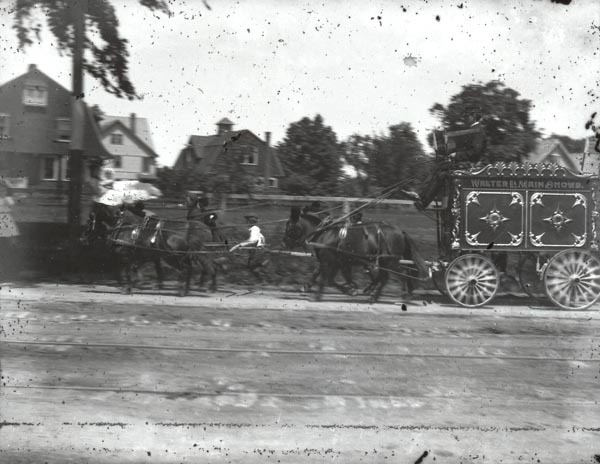 Clear, close, 8” x 10” copy photo from an original at the Western Reserve Historical Society, shows excellent detail of the 1875 Type Cleveland Life-saving station as seen from the west. Good detail of the interior of the station and surrounding area. (VG+). $64. 15193. (photo) Cleveland West Pierhead Lighthouse c.1910 winter view. 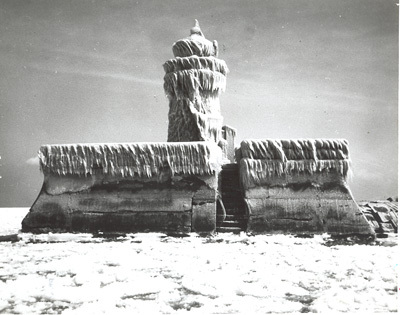 Copy photo from Coast Guard archives shows the Cleveland West Pierhead Lighthouse encased in ice in 1910. 8” x 10”. (VG+). $12. 1538. 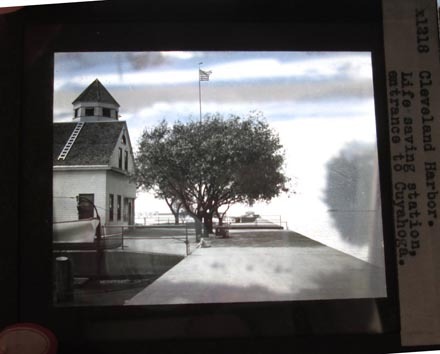 (glass projection slide) U.S. Life-Saving Station, Cleveland Harbor c.1900. Superb vintage 3 ¼” x 4” inch glass projection slide provides an excellent view of the Modified Jersey Pattern Life-Saving station located on the west side entrance to Cleveland Harbor. Great view of the nicely kept station with octagonal watch tower, with the standard wind vane on top of the flagpole in the background. Superb clear view will show well. Great detail. (VG+). $44. 1489. (photo) U. S. Coast Guard Radio Station Gates Mills, Cleveland, Ohio c.1957. 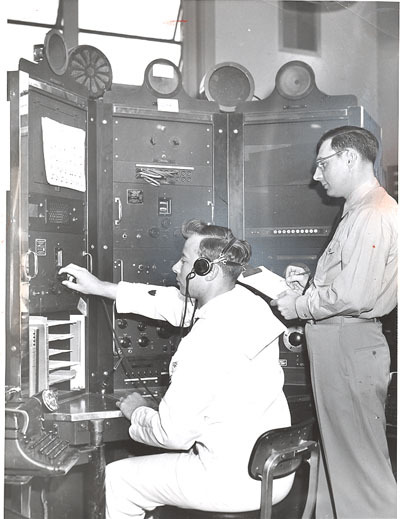 Clear, close, original 7” x 9” press photo shows excellent detail of Chief Radioman Albert R. Krouse, Jr. and SM/R< John H. Morrill operating the radio equipment at Coast Guard Radio Station Gates Mills. The Coast Guard radio stations were established in the 1920’s and were responsible for communicating with coastal and lakes shipping and documenting any distress alerts. 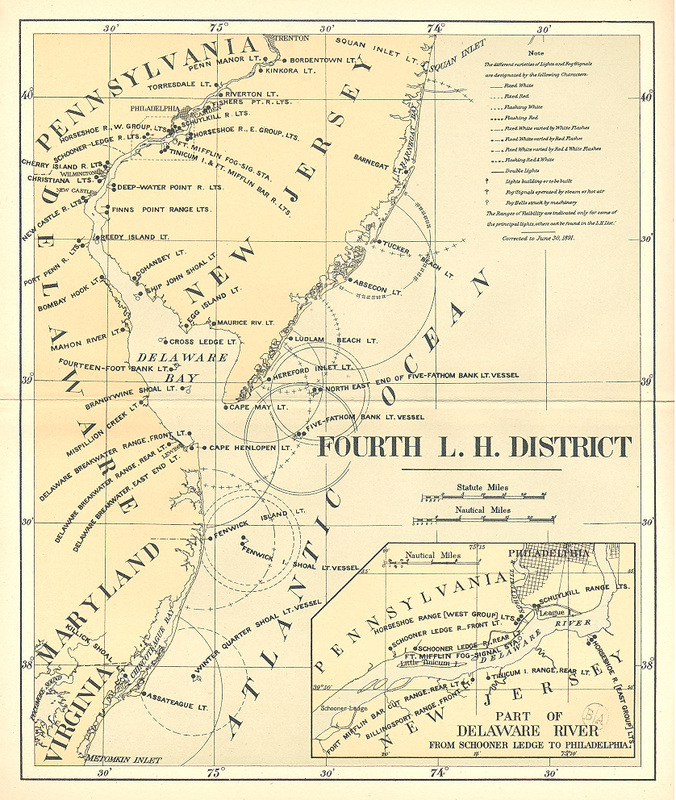 The Coast Guard's role in communications developed during the Prohibition Era when a need was established for communications with over 300 75-footers pressed into service to deal with smugglers. Prior to this time its vessels were equipped with Navy type radio apparatus and used Navy frequencies for handling ship-shore traffic. Good detail of the men and equipment. Photo is b/w and includes date and identifications on back. Dated August 13, 1957. (VG+). $54. BR-97. na. A History of Fairport Harbor Ohio. Plainsville. 1990. 3rd. 303p. Soft wraps. 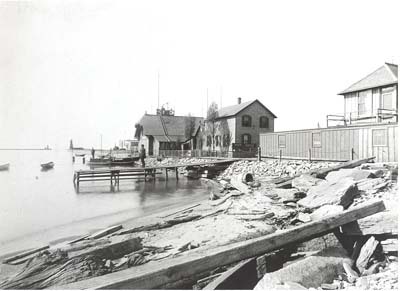 Fairport Harbor's early history and development is the story of the Western Reserve. The favorable harbor played an important role in the building of this part of the Western Reserve. It was a port of call for boats carrying immigrants from Europe, going to the upper lake regions, and a haven of calm water for boats in a storm. Filled with history of the area including the Life-Saving and Coast Guard station, the lighthouses, fire and police departments, and more. (VG+). $9. 2989. (lot negatives / contact prints) Walter L. Main Circus Parade c.1900. Lot of 10 wonderful close, clear views show portions of the circus parade of the Walter L. Main Circus c.1900. Walter L. Main, had an outstanding career in the circus business during 1887-1939. His Walter Main Circus, headquartered in Geneva, Ohio, was, at a time, one of the largest traveling railroad circuses in the world. After selling his own circus in 1905 he reverted to primarily leasing his name to other showmen. That was the case in 1932, when it went to James Heron, and 1933, when Tom Gorman had it. The Walter L. Main Circus was a popular circus during the late 1800s through mid-1900s. Main's circus outfit had to perform in smaller cities during this time because of stiff competition from the larger circus companies taking dates in the bigger cities of America. Main’s circus offered such performers as Adelle Houbignant (the greatest somersaulting bare back rider of all time), Aline Dumas (France's loveliest and most intrepid queen of the lofty trapeze), Mike and Ike ( the world famous twin-midgets), Miss Naida Miller (whirlwind on the high wire), Major and Mrs. Pee Wee McLaughlin, a wolfman, clowns galore and much more. Negative views include: Ponies pulling a large circus wagon lettered "WALTER L MAIN SHOWS. "; young child walking alongside parade of soldiers; uniformed members of un-named Lodge organization marching; two men on horseback, in royal attire, in front of animal cage; Woman jumping from high pole into net; soldiers / band on horseback; line of four circus elephants; early automobile; men on horseback with a flag – labeled “Turks”; and a woman in ethnic clothing riding a camel. Additional contact prints (without negatives) include: Features man in horse drawn carriage with African American children walking along side. "Buffalo Bill" handwritten on back; Native Americans on horseback; Soldiers riding caisson - handwritten on back: "Gatlin Gun”; and mules pulling stagecoach. Each negative is in a labeled envelope with notations on the outside. 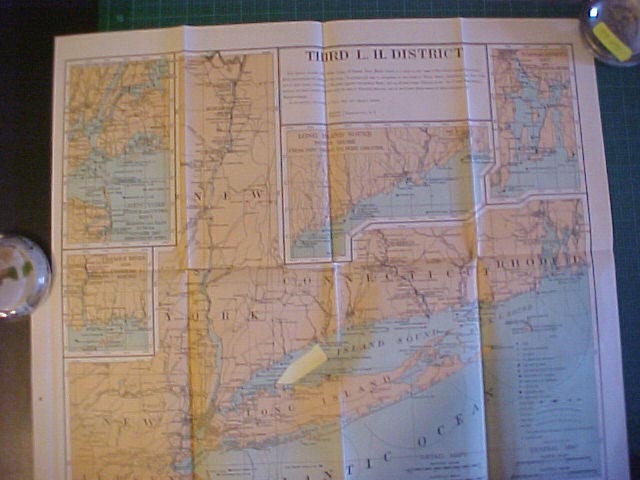 Large format negatives measure approximately 3 ½” x 4 ½”. Overall condition of the negatives is very good. Ten negatives, 20 contact prints (some duplication). Wonderful close, clear views. (VG). $128. 27398. (set 3 photos) Steamboats City of Cincinnati and City of Louisville c.1910. 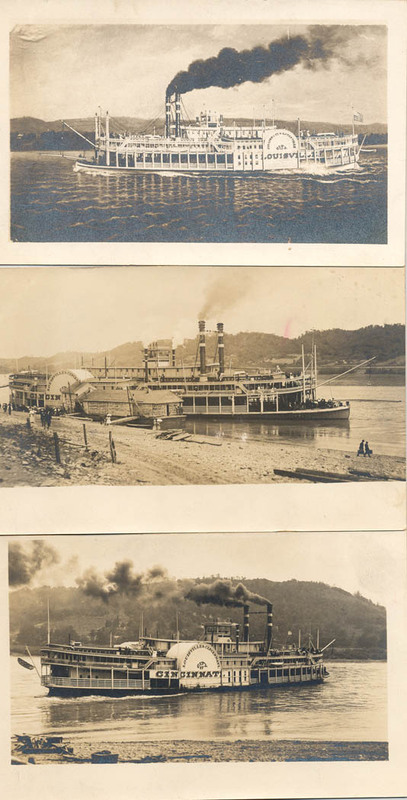 Three clear, close views provide excellent detail of these well known Ohio River steamboats. Their fate - in 1918, the Ohio River, frozen for 51 days, crushed the hulls of the steamers City of Cincinnati, City of Louisville, Greenland, Loucinda, Julius Fleischman, Val. P. Collins, Island Princess and Island Queen. Measuring 5” x 3 ½” and printed on postcard paper, photos are clean and clear. (VG+). $68. Page updated September 20, 2016 . All text and illustrations on web site Ó James W. Claflin . 09/20/2016 All rights reserved. Use prohibited without written permission.